Chromosome 2 is one of the 23 pairs of chromosomes in humans. People normally have two copies of this chromosome. Chromosome 2 is the second-largest human chromosome, spanning more than 242 million base pairs (the building material of DNA) and representing almost 8% of the total DNA in human cells. Human chromosome 2 pair after G banding. One is from mother, one is from father. Chromosome 2 contains the HOXD homeobox gene cluster. All members of Hominidae except humans, Neanderthals, and Denisovans have 24 pairs of chromosomes. Humans have only 23 pairs of chromosomes. Human chromosome 2 is a result of an end-to-end fusion of two ancestral chromosomes. The correspondence of chromosome 2 to two ape chromosomes. The closest human relative, the chimpanzee, has near-identical DNA sequences to human chromosome 2, but they are found in two separate chromosomes. The same is true of the more distant gorilla and orangutan. The presence of a vestigial centromere. Normally a chromosome has just one centromere, but in chromosome 2 there are remnants of a second centromere in the q21.3–q22.1 region. The presence of vestigial telomeres. These are normally found only at the ends of a chromosome, but in chromosome 2 there are additional telomere sequences in the q13 band, far from either end of the chromosome. According to researcher Jacob W. Ijdo, "We conclude that the locus cloned in cosmids c8.1 and c29B is the relic of an ancient telomere-telomere fusion and marks the point at which two ancestral ape chromosomes fused to give rise to human chromosome 2." The following are some of the gene count estimates of human chromosome 2. Because researchers use different approaches to genome annotation their predictions of the number of genes on each chromosome vary (for technical details, see gene prediction). Among various projects, the collaborative consensus coding sequence project (CCDS) takes an extremely conservative strategy. So CCDS's gene number prediction represents a lower bound on the total number of human protein-coding genes. See also: Category:Genes on human chromosome 2. The following is a partial list of genes on human chromosome 2. For complete list, see the link in the infobox on the right. G-banding ideogram of human chromosome 2 in resolution 850 bphs. Band length in this diagram is proportional to base-pair length. This type of ideogram is generally used in genome browsers (e.g. Ensembl, UCSC Genome Browser). G-banding patterns of human chromosome 2 in three different resolutions (400, 550 and 850). Band length in this diagram is based on the ideograms from ISCN (2013). This type of ideogram represents actual relative band length observed under a microscope at the different moments during the mitotic process. ^ "Human Genome Assembly GRCh38 - Genome Reference Consortium". National Center for Biotechnology Information. 24 December 2013. Retrieved 4 March 2017. ^ a b "Search results - 2[CHR] AND "Homo sapiens"[Organism] AND ("has ccds"[Properties] AND alive[prop]) - Gene". NCBI. CCDS Release 20 for Homo sapiens. 8 September 2016. Retrieved 28 May 2017. ^ Tom Strachan; Andrew Read (2 April 2010). Human Molecular Genetics. Garland Science. p. 45. ISBN 978-1-136-84407-2. ^ a b c Genome Decoration Page, NCBI. Ideogram data for Homo sapience (850 bphs, Assembly GRCh38.p3). Last update 2014-06-03. Retrieved 2017-04-26. ^ Hillier; et al. (2005). "Generation and annotation of the DNAD sequences of human chromosomes 2 and 4". Nature. 434 (7034): 724–31. Bibcode:2005Natur.434..724H. doi:10.1038/nature03466. PMID 15815621. ^ Meyer M, Kircher M, Gansauge MT, Li H, Racimo F, Mallick S, et al. (October 2012). "A high-coverage genome sequence from an archaic Denisovan individual". Science. 338 (6104): 222–6. Bibcode:2012Sci...338..222M. doi:10.1126/science.1224344. PMC 3617501. PMID 22936568. ^ It has been hypothesized that Human Chromosome 2 is a fusion of two ancestral chromosomes by Alec MacAndrew; accessed 18 May 2006. ^ Yunis and Prakash; Prakash, O (1982). "The origin of man: a chromosomal pictorial legacy". Science. 215 (4539): 1525–30. Bibcode:1982Sci...215.1525Y. doi:10.1126/science.7063861. PMID 7063861. 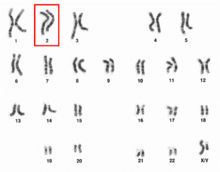 ^ Human and Ape Chromosomes; accessed 8 September 2007. ^ Avarello; et al. (1992). "Evidence for an ancestral alphoid domain on the long arm of human chromosome 2". Human Genetics. 89 (2): 247–9. doi:10.1007/BF00217134. PMID 1587535. ^ a b Ijdo, Jacob W.; et al. (1991). "Origin of human chromosome 2: an ancestral telomere-telomere fusion". Proc. Natl. Acad. Sci. U.S.A. 88 (20): 9051–5. Bibcode:1991PNAS...88.9051I. doi:10.1073/pnas.88.20.9051. PMC 52649. PMID 1924367. ^ Pertea M, Salzberg SL (2010). "Between a chicken and a grape: estimating the number of human genes". Genome Biol. 11 (5): 206. doi:10.1186/gb-2010-11-5-206. PMC 2898077. PMID 20441615. ^ "Statistics & Downloads for chromosome 2". HUGO Gene Nomenclature Committee. 12 May 2017. Retrieved 19 May 2017. ^ "Chromosome 2: Chromosome summary - Homo sapiens". Ensembl Release 88. 29 March 2017. Retrieved 19 May 2017. ^ "Human chromosome 2: entries, gene names and cross-references to MIM". UniProt. 28 February 2018. Retrieved 16 March 2018. ^ "Search results - 2[CHR] AND "Homo sapiens"[Organism] AND ("genetype protein coding"[Properties] AND alive[prop]) - Gene". NCBI. 19 May 2017. Retrieved 20 May 2017. ^ "Search results - 2[CHR] AND "Homo sapiens"[Organism] AND ( ("genetype miscrna"[Properties] OR "genetype ncrna"[Properties] OR "genetype rrna"[Properties] OR "genetype trna"[Properties] OR "genetype scrna"[Properties] OR "genetype snrna"[Properties] OR "genetype snorna"[Properties]) NOT "genetype protein coding"[Properties] AND alive[prop]) - Gene". NCBI. 19 May 2017. Retrieved 20 May 2017. ^ "Search results - 2[CHR] AND "Homo sapiens"[Organism] AND ("genetype pseudo"[Properties] AND alive[prop]) - Gene". NCBI. 19 May 2017. Retrieved 20 May 2017. ^ Swaminathan, Nikhil. "Largest Ever Autism Study Identifies Two Genetic Culprits". Scientific American. Retrieved 25 January 2018. ^ Genome Decoration Page, NCBI. Ideogram data for Homo sapience (400 bphs, Assembly GRCh38.p3). Last update 2014-03-04. Retrieved 2017-04-26. ^ Genome Decoration Page, NCBI. Ideogram data for Homo sapience (550 bphs, Assembly GRCh38.p3). Last update 2015-08-11. Retrieved 2017-04-26. ^ International Standing Committee on Human Cytogenetic Nomenclature (2013). ISCN 2013: An International System for Human Cytogenetic Nomenclature (2013). Karger Medical and Scientific Publishers. ISBN 978-3-318-02253-7. ^ Sethakulvichai, W.; Manitpornsut, S.; Wiboonrat, M.; Lilakiatsakun, W.; Assawamakin, A.; Tongsima, S. (2012). Estimation of band level resolutions of human chromosome images. In Computer Science and Software Engineering (JCSSE), 2012 International Joint Conference on. pp. 276–282. doi:10.1109/JCSSE.2012.6261965. ISBN 978-1-4673-1921-8. ^ "p": Short arm; "q": Long arm. ^ For cytogenetic banding nomenclature, see article locus. ^ a b These values (ISCN start/stop) are based on the length of bands/ideograms from the ISCN book, An International System for Human Cytogenetic Nomenclature (2013). Arbitrary unit. ^ gpos: Region which is positively stained by G banding, generally AT-rich and gene poor; gneg: Region which is negatively stained by G banding, generally CG-rich and gene rich; acen Centromere. var: Variable region; stalk: Stalk. Wikimedia Commons has media related to Human chromosome 2. National Institutes of Health. "Chromosome 2". Genetics Home Reference. Retrieved 6 May 2017. "Chromosome 2". Human Genome Project Information Archive 1990–2003. Retrieved 6 May 2017.